Violation of any rule or blatant disregard for the safety of others may subject a participant to disqualification from the current year’s race and possible disqualification from future races. Racers are required to start in the wave they are assigned to ensure accurate race timing, safety, and balanced wave sizes. There is a mechanism to request a wave (bib) change. Any blatant disregard of this rule may subject the participant to disqualification from the current year’s race and possible disqualification from future races. All racers must reach the Cut-Off time Checkpoint on the mountain before the cut-off times listed below AND complete the race before the cut-off times listed below, or they will be disqualified from the race. Any racer who continues on the race course after the cut-off times on the mountain will be disqualified from entering future Mount Marathon races. Adult racers must cross past the Junior Race Point (1/2 way up the mountain) within one hour (60 minutes) of their start time. Adults that do not complete the race within 2.5 hours will not receive an official time. Junior racers must cross by Squirrels’ Inn within 30-minutes of their start time, and complete the race in 1.5 hours or less to remain eligible for Priority Status. Before first-time racers will be allowed to pick up their bib, racers (or their parent or guardian if under 18) must sign a statement stating they have completed the entire race course prior to race day. Routes on the race course can be closed by emergency responders and by race officials. Racers who continue along a close section of the race course after being informed of the closure may be disqualified from the current race and banned from participating in future races. The most commonly closed section of trail is the waterfall due to the location of an injured runner and responding emergency personnel. Race officials will station volunteers at intersections to inform racers of closures. Racers who picked up a bib that do not start or finish the race must notify a race official at the finishline as soon as possible. No shoes with metal cleats. No identifying markers on the trail to guide runners. No assistance on the trail except for first aid and dispensing of water. No unfair or unsafe acts. No headphones or listening devices. Every runner must give way to a runner shouting “trail” in the act of passing. Any runner still on the trail from an earlier race shall give way to runners in the current race. Applicants may not falsify any information on the application form. Participants in the adult races must show a valid photo I.D. when picking up their bib or face disqualification. Participants may not trade bibs or provide their bibs and race identification to other individuals. Runners must have their race bib with embedded timing chip when crossing the finish line. Adults that finish the Mt. Marathon Race in 2.5 hours or less will receive an official time and their finish will be counted towards 10-year status (a racer who has completed 10 or more non-consecutive adult races) for priority registration status. Bandits are individuals who join the field of Mount Marathon Race® competitors under fraudulent circumstances – obtaining a legal bib using false identification, using another runner’s bib, or breaking into the field of runners at any point without a bib or using a falsified bib. A bandit creates safety and liability issues for both other participants and race officials. Bandits also create errors in race timing if they cross the finish line. Bandits steal resources meant for registered runners who pay for them such as emergency personnel, permit fees, insurance costs, etc. If a bandit sustains an injury or other medical emergency, the race officials may not know who that person is or may think it’s someone else. This could result in serious consequences. Bandits violate the spirit of sportsmanship endorsed by the Mount Marathon Race® and more importantly, impair the safety of all participants. As a result, identified bandits may face a lifetime ban from participating in the Mount Marathon Race®, ban from other Alaska running events, and possible legal action. 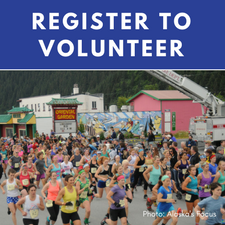 Each participant must sign a Waiver of Liability absolving the City of Seward, the Seward Chamber of Commerce, and any or all individuals connected with the race of any responsibility for injuries incurred while training for the race or during the race. A parent or legal guardian must sign the waiver on behalf of any participants in the Junior race. Acknowledgement of this Waiver of Liability during the online MMR Racer Registration and Lottery Application processes constitutes your signature on the Waiver. 1. I understand and acknowledge that the mountain race I am about to engage in as a participant bears certain known risks and unanticipated risks which could result in physical or emotional injury, death, paralysis, or damage to myself or spectators or other third parties. I understand that such risks simply cannot be eliminated without jeopardizing the essential qualities of the race. The risks inherent to mountain trail running. Risks incurred due to inclement weather conditions, including but not limited to high winds, rain, snow as well as excessive heat. Risks incurred due to hazardous contact with plants or wild animals. My own physical condition, or my own acts or omissions. Risks incurred due to conditions of the race trail or terrain. Risks incurred from receiving First Aid, emergency treatment or other wilderness medical services rendered. Risks incurred due to the distance of this activity’s location from emergency medical facilities. 2. Being aware that this activity entails known and unknown risks of injury to myself and a risk of injury to spectators or other third parties as a result of my actions, I expressly agree, covenant, and promise to accept and assume all responsibility and risk for injury, death, illness or disease, or damage to myself to others arising from my participation in this race. My participation in this activity is purely voluntary, no one is forcing me to participate, and I elect to participate in spite of the risks. 3. I hereby voluntarily release, forever discharge, and agree to hold harmless and indemnify the Mt. Marathon Race organizers and their employees, volunteers and all other persons or entities from any liability, claims, demands, actions or rights of actions, which are related to, arise out of, or are in any way connected with my participation in this race, including specifically but not limited to, the acts or omissions of the Mt. Marathon Race organizers, their volunteers or employees, and all other persons or entities for any and all injury, death, illness or disease, and damage to myself. 4. Should it become necessary for the Mt. Marathon Race organizers or someone on the Mt. Marathon Race organizers behalf, incur attorney’s fees and costs to enforce this agreement, or any part thereof, I agree to pay the Mt. Marathon Race organizers reasonable costs and attorney’s fees thereby expended, or for which liability is incurred. 5. I certify that I have sufficient health, accident and liability insurance to cover any bodily injury I may incur while participating in this event and to cover bodily injury caused to a third party as a result of my participation in this event. If I have no such insurance, I certify that I am willing to and capable of personally paying for any and all such expenses or liability. 6. In the event that I file a lawsuit against the Mt. Marathon Race organizers, I agree to do so solely in the state of Alaska, and I further agree that the substantive law of that state shall apply in that action without regard to the conflict of law rules of that state. 7. I authorize the use of my photogenic image for inclusion in any Mt. Marathon Race brochure or for any other advertising purposes. 8. The Mount Marathon Race committee recognizes that the use of performance enhancing drugs give users an unfair performance advantage over non-users. Performance enhancing drugs include anabolic steroids and any other natural or synthetic substance used to increase muscle mass, strength, endurance, speed or other athletic ability, excluding dietary and nutritional supplements such as vitamins, minerals, and proteins which can be lawfully purchased over-the-counter. Those individuals who use performance enhancing drugs are prohibited from participation in the Mount Marathon Race. I attest that I am, and will remain, performance enhancing drug free. BY SUBMITTING MY RACER REGISTRATION OR LOTTERY APPLICATION ONLINE, I FULLY RECOGNIZE THAT IF ANYONE IS HURT WHILE I AM ENGAGED IN THIS EVENT, I WILL HAVE FREELY GIVEN UP MY RIGHT TO MAKE A CLAIM OR FILE A LAWSUIT AGAINST THE MT. MARATHON RACE ORGANIZERS, AS WELL AS THEIR OFFICERS, AGENTS, VOLUNTEERS AND EMPLOYEES, EVEN IF THEY OR ANY OF THEM CAUSED THE BODILY INJURY. I RECOGNIZE THAT MOUNTAIN TRAIL RUNNING IS INHERENTLY RISKY AND DANGEROUS AND AM PARTICIPATING IN THIS EVENT IN SPITE OF THE RISKS. CHECKING THE BOX BELOW INDICATES THAT I HAVE READ THIS ENTIRE DOCUMENT, UNDERSTAND IT COMPLETELY, UNDERSTAND THAT IT AFFECTS MY LEGAL RIGHTS, AND AGREE TO BE BOUND BY ITS TERMS.